One Story Up has moved! If you've been wondering where all the updates are, you've been missing out! This blog has moved to another site - true/slant.com. Same stories, same author, same stuff - just a new address. This site will hold the archive for awhile, but all new updates and posts will be on true/slant. All my old posts are now up on true/slant too (although they need to be edited for layout, and that process is happening slowly). As always, you can follow me on twitter - @mmcottrell. Please change your bookmarks and subscriptions! See you on the other side! 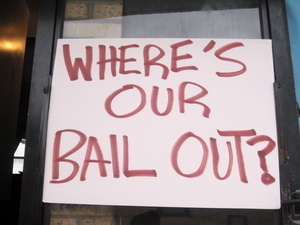 Where's the bailout for the poor? Fifty people gathered around Lenise Forrest's home in Cabrini-Green this morning, asking a very pertinent question: "Where's our bailout?" They gathered to stop Lenise from being evicted and to start a new movement - the Chicago Anti-Eviction Campaign. They say they're going to stop any eviction in the city that's happening because of a person's economic means. The rich got bailed out, they say. We will not be put out. Today, I got the news that my mentor just died. I'm really heartbroken. I'm in pieces, actually. What is there to do or say, except to write? The medium we both loved best. David McClendon was hired at the Chi-town Daily News just a couple of weeks before I started there as an intern. We sat back to back in a small office. On my second day, David got my attention by turning around and poking me in the back of the neck. It was weird, and I remember thinking, "I don't know about this guy... Who pokes their new co-worker in the back of the neck?" Yeah, I'm terrible with first impressions. Last Tuesday was really frightening, but it's this Tuesday that Lenise Forrest really fears. Last Tuesday, she says, the sheriff came to her two-bedroom apartment in Cabrini-Green, knocking on the door briefly before kicking it down. Several men came in, she says, putting guns on her and her brother and serving her with an eviction notice. Seven days, they said, and they would be back. So it's tomorrow that's worrying her. The day the sheriff comes back to haul her and all her things out of her apartment and onto the street. Where will you go? I ask. I don't know, she says. Until you earn about $40,000 a year, you're pretty much stuck in poverty, economists' numbers show. African Americans make up a third of Chicago's population. But they're nearly half of the city's disabled population. What accounts for that disparity? It's not race. It's poverty. According to statistics from a recent edition of the Chicago Reporter, when you control for poverty, that racial imbalance disappears. Why does that imbalance exist? Victory for Chicago family facing eviction! If you're new to One Story Up, you might not be familiar with the Bledsoe family. Back in July, we met the family - three children who were living with their grandmother in Rogers Park when she suddenly died. 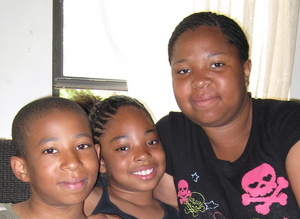 Their aunt - Erica Bledsoe - became their guardian, but the company that owned their Section 8 apartment wanted to evict the family, which would have left them homeless. After months of organizing and community support, HUD stepped in and got the company to give the family a lease. The story is pretty moving and poignant - you can listen to Erica Bledsoe tell her story on Vocalo with me last week. We're getting together to celebrate this important victory, next Saturday, November 14th at Mess Hall - 6932 North Glenwood Ave in Chicago from 6:30 p.m. to 8:30 p.m. It'll be a potluck with music and discussion of further efforts to start grassroots organizing within the Northpoint apartment community. 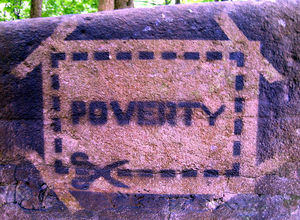 Three simple rules for getting out of poverty - but how easy are they? We're a nation of bootstraps. Pull hard enough and you can pull yourself from rags to riches. Or so we like to think. New research suggests we're not as strapping as we might think when it comes to economic mobility. New research from the Brookings Institution shows that economic mobility - the chance a child born into a poor family has to escape poverty - isn't as robust as we might think. If you're born into a middle-class family, there's a 76 percent chance you'll end up middle class or even wealthier. Born into a poor family? Only a 35 percent chance. But Brookings has a solution. Three simple rules to end up middle class, no matter how low you started out. What are they? 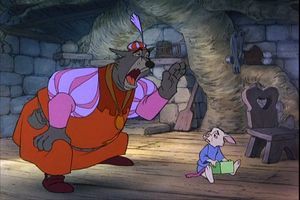 If you've ever seen Disney's Robin Hood, you might remember a scene where the rotund sheriff of Nottingham steals the birthday present of a 7 year-old rabbit, a gold coin his poor rabbit family scrimped and saved to give him. The state of Illinois is getting in on that action. A report by the Center on Budget and Policy Priorities shows 16 states that gouge even the poorest of the poor on their income taxes. The report measured the threshold at which states stop taxing - how low you can go until you don't owe. Illinois? We can go pretty low. Two U.S. cities are engaged in a knock-down-drag-out fight over public housing in their communities: Galveston, Texas and Huntsville, Alabama. In Galveston, Hurricane Ike demolished 569 units of public housing just a year ago. Now residents of Galveston don't want that public housing rebuilt. And in Huntsville, the local housing authority is planning to buy some foreclosed homes and turn them into public housing. But not if the upper middle-class residents of South Huntsville have anything to say about it. They even took out an ad in the local paper, stating "Public housing is coming to your neighborhood," trying to get people to come out to a local meeting, where either side engaged in a heated debate over whether public housing should be allowed there. It's not just Galveston and Huntsville - it's everywhere. People have a visceral reaction to the words "public housing" and it's usually not good. These reactions often appear in the comments sections of articles like this or on this blog, at community meetings and in other public forums. Beatrice Harris calls everybody baby. "How ya doin', baby?" "Hey, baby." "Don't worry about it, baby." She's earned the right. As one of the matriarchs of Chicago's Wentworth Gardens, she says she's had a tough job in the last few years, trying to make one community out of a divided complex. For years, Wentworth, a small housing development directly south of the White Sox stadium, served as a "relocation resource" in the Plan for Transformation. As Chicago tore down the massive high rises that were Wentworth's neighbors, like Stateway Gardens and the Robert Taylor Homes, Wentworth took in many of those displaced by the demolition. The low-rise development is a patchwork quilt of families from different parts of the city: Altgeld Gardens, Ida B. Wells, Stateway, LeClaire Courts, Harold Ickes, Deaborn Homes and the list goes on. Like families are living together, Harris says. One whole corner of Wentworth is dedicated to former Ida B. Wells residents, a trend Harris says serves to further divide people. "Nobody wants to trust nobody," she says. Just wanted to let you know that starting today, I'll be making the transition over to a new site. 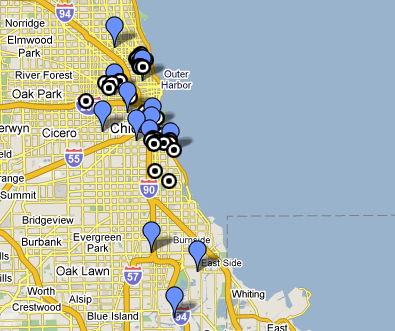 I'm moving One Story Up from ChicagoNow to True/Slant, another blog site with more of a news focus. Same stories, same person, same everything - just a new address. For the next couple of weeks, I will be blogging in both places and slowly directing you, my loyal readers, to the new site. 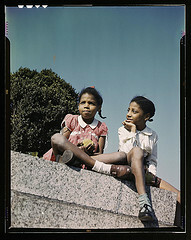 It will take a few weeks for the total of my archives here to be moved to my new blog. Please be patient. I've really enjoyed starting my blog here at ChicagoNow. It's been a wonderful opportunity, one I hope to expand upon. I've loved the community here at ChicagoNow, especially working with great contributors like Teresa Puente, Marian Wang, Joe the Cop and Alexander Russo. I'll miss being a direct part of the community, but I'll still be on the site a lot - reading, commenting and enjoying everyone's fine work. Hear One Story Up on Vocalo this month! Tune in to 89.5 FM on Tuesday mornings from 9 to 10 a.m. all through November to hear stories from One Story Up on Vocalo, Chicago Public Radio's little sister station. This week, I'll be talking with Erica Bledsoe, who narrowly escaped the eviction of herself and her three nieces and nephews last month after her mother died suddenly last year. The story started here on One Story Up and quickly morphed into a vigil, protest and movement to help the family stay in their home. 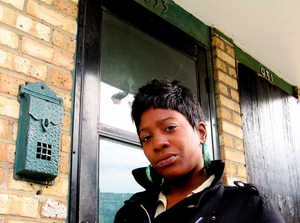 Each Tuesday will be a new guest, talking with me about stories from Chicago's public housing. Tune in and tell me what you think! 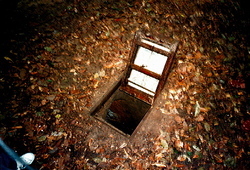 You can listen on the web or participate through the web. 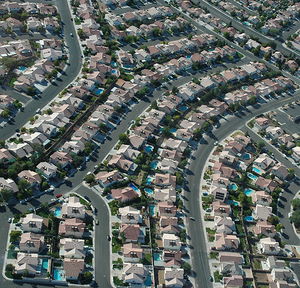 A slow housing market means sellers everywhere are trying to lure buyers into purchasing a home. The Chicago Housing Authority is no different. If you purchase a home in one of the Plan for Transformation's new mixed-income communities, you could save up to $118,000, according to a press release from Find Your Place in Chicago, a marketing campaign from the city of Chicago and The Partnership for New Communities. 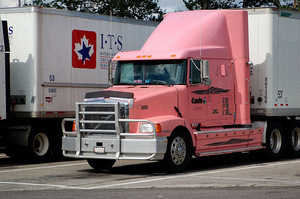 I imagined she would be austere and solemn. Sort of like the White Witch of Narnia, only not evil and speaking several languages. Turns out that Raquel Rolnik, the United Nations Special Rapporteur on Adequate Housing, is anything but reserved. It's not often you meet a Brazilian housing policy expert who empathizes with a black man from Chicago's public housing, but that's just what Rolnik is like. On her three day visit to Chicago, she's taken to the streets, trying to meet people and hear their stories directly. 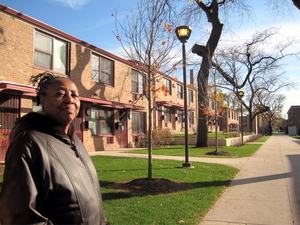 Her tour of Chicago's public housing started at the city's most famous development - Cabrini-Green. 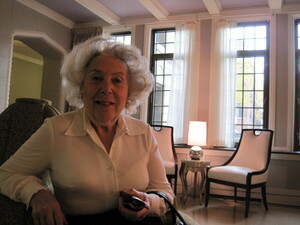 Sylvia Lawrence sits in the Britton Budd lobby. 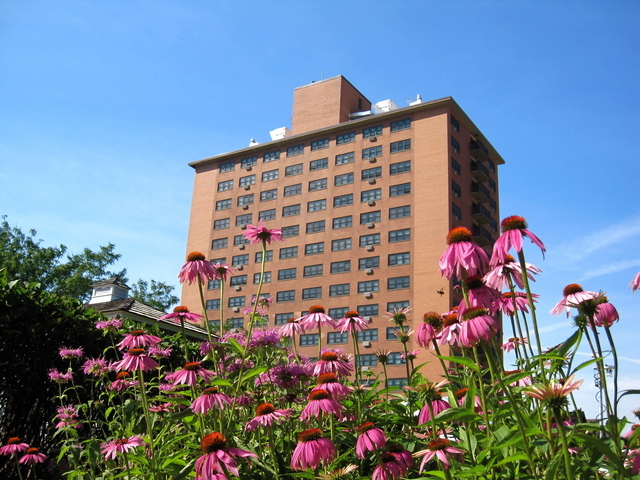 The historic building was rehabbed by the Chicago Housing Authority and offers 173 units for seniors in the Lakeview neighborhood. Sometimes, you think your life is over, and really, it's just about to start again. Sylvia Lawrence has been living in Britton Budd Apartments, a senior building on the North Side, for just a week, and already she loves it. "It's like living at the Ritz, but without paying the excises," she told me. Many years back, her husband died. Then, ten years ago, her son passed away as well. She didn't realize it at the time, but over the years, she grew lonely. Her circle of people got smaller and smaller. And so last year, Sylvia, age 86, packed up her bags and moved from her home in England to a new home in Chicago, where her daughter lives. 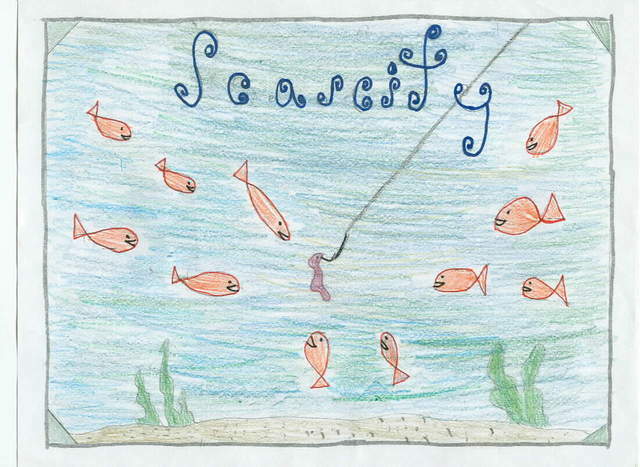 Man, kids these days are getting so sophisticated. The Treasury Inspector General found that the "U.S. failed to adequately screen filings" for the government's $8,000 homebuyer tax credit. 582 people under the age of 18 seem to have applied for the credit, just a handful of the nearly 74,000 suspicious filings so far. We all know it isn't easy to find an affordable place to live in Chicago. The Chicago Rehab Network says that to afford a modest one-bedroom apartment at $711 a month, a person would either have to earn at least $13.67 an hour or work 106 hours a week at the minimum wage. But is housing so unaffordable that it violates human rights? The United Nations is here in Chicago to find out. 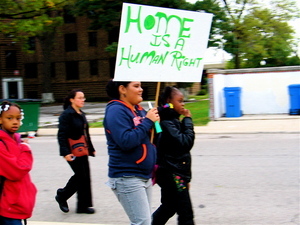 The UN Special Rapporteur on housing will visit the United States with seven stops in major cities, including Chicago. My mom and I had a long conversation this morning. She immigrated here where she was seven years old. Her parents grew up in Poland, were both captured by the Russians during World War II. After the war was over, they wanted to return to Poland, but the communist takeover prevented it. Instead, they started a new life in America. So my mom gets pretty mad when the ladies on her golf league talk about dirty immigrants stealing from hard-working Americans. "That's me you're talking about," she says. Need a place to sit down? I took a visit to Altgeld Gardens this morning. 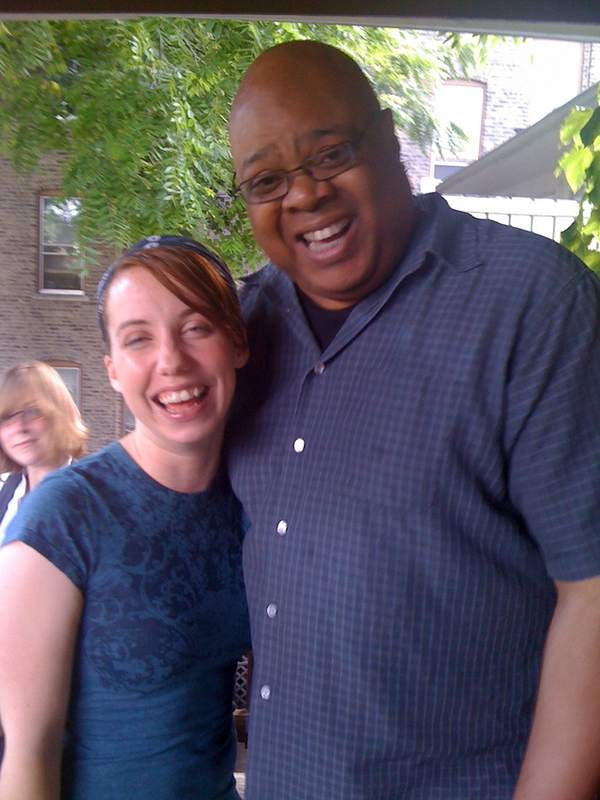 The woman I was meeting, Bernadette Williams, was called into an emergency relocation meeting. So, I'm going back to see her next week. But I didn't go all the way down to 133rd street for nothing. 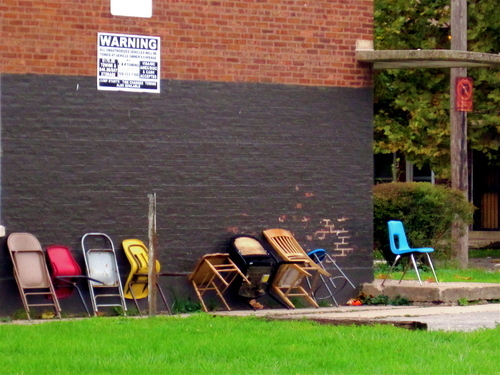 These chairs, propped up along the side of one of the Altgeld rowhouses, caught my eye. Rainy day. Sometimes great plans don't work out as you thought. But I'm glad I got this picture. Do white families deserve the crime Section 8 tenants bring with them? Maybe middle-class white families deserve the crime and disorder that some Section 8 tenants are bringing into their lives. 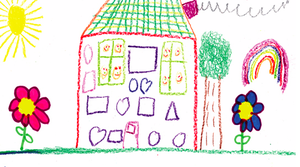 Joe the Cop and I have been writing back and forth about the problems with Section 8 housing. I wrote about how we know concentrated poverty doesn't work, but no one wants Section 8 tenants living next door to them personally. 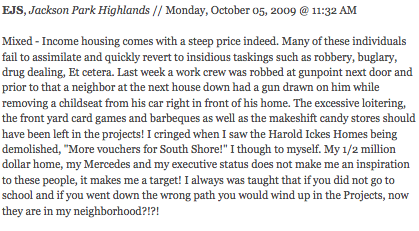 Joe wrote about his personal experiences with Section 8 tenants in the suburbs. He had some really frightening and sobering stories about neighborhoods that have been drastically altered by former inner-city families moving in down the street. This weekend, the Chicago Housing Authority and national nonprofit Operation Warm will give out 10,000 coats to public housing kids across the city. 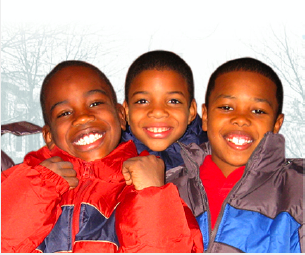 Any public housing resident with a child born after January 1st, 1995 is eligible to receive one new coat per child. To reserve a coat for your child, you can sign up on the CHA youth website or by calling the hotline at (312) 786-3621. "Kids grow fast and are often in need of a new coat every single year," says Kristen Hamer, director of community relations at CHA. "It's an expense our families don't have to incur this year if they take advantage of this initiative." Of the 10,000 coats available, about 7,000 are already spoken for with about 3,100 families registered. "If there are kids in need of a brand new winter coat, they can tive them for free with this initiative, but they have to act quickly, as we're giving them out this Saturday," says Hamer. Operation Warm is one of the nation's largest non profits providing new winter coats to children in need. Last year, the organization reached out to mayor's office to partner with someone here in Chicago to distribute coats. The Chicago Department of Family and Support Services also received about 1,000 coast both this year and last year that will be distributed to kids through homeless shelters. Eugene Bailey leaves Cook County jail after his release Monday. Photo by Jason Wambsgans of the Tribune. There's been a lot of talk today over Eugene Bailey, a Roseland teen charged and later exonerated in the beating and death of Derrion Albert. Bailey and his mom, Ava Grayer, were served with an "intent to terminate" notice from the Chicago Housing Authority, letting them know that Chicago Housing Authority was planning to evict them from their Section 8 apartment over the charges. Many people were outraged. A family evicted just for someone being charged? What about due process? And why should the mother be evicted for her son's behavior? What causes homelessness? Take a minute to think about it and try to list five reasons people become homeless. Job loss, mental illness, drug or alcohol addiction, divorce, domestic violence, medical emergency, natural disaster. Maybe these were some of your answers. 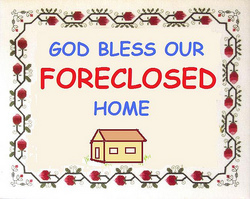 Try this new one on for size: foreclosure. 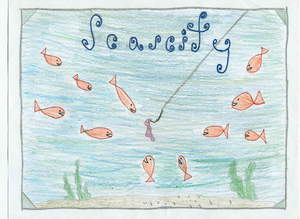 NIMBY: if not your backyard, then whose? Mark Horvath's work telling the stories of homeless people around the nation is always moving, heartbreaking and important. The day I spent with him in Chicago is one I will never forget. Every story is significant, but Joni's story really touched me. Mark met Joni in Times Square where she was busted for trying to steal a cup of coffee. When he asks her what her three wishes would be, her voice cracks and her face twists to keep from crying. Her wishes? A home, to wake up with food, and that someone would just stop what's happening on the streets. Take a moment to hear Joni's story. Joni from InvisiblePeople.tv on Vimeo. After about two months on the public housing beat, I got frustrated. I walked to Walgreens, bought a city map and some stick-on colored labels. I sat down on my living room floor and spent an afternoon creating a map of the city's public housing - where everything is, what the former and current name is and what's been done there. I carry that map with me in my reporting bag because it's so useful. But now, you can see a map too, thanks to University of Chicago graduate student, photographer and all-around interesting person David Schalliol. Schalliol made a google map of the Plan For Transformation. It has the location of all the family developments (blue dots), the mixed-income communities (black and white targets) with their new and former names. Technology is awesome! Thanks, David! I visited two South Side landmarks today, one being rebuilt and one in its final days. 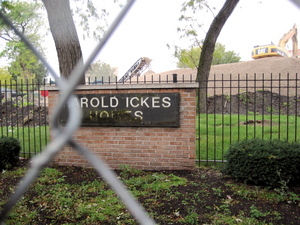 Today, I went down to Harold Ickes Homes to see the last two buildings as they came down. The first time I saw Ickes, I was standing on the Cermak/Chinatown red line platform. Ickes was the defining landmark as you looked South East. Today, I saw a lot of new things, but I didn't see Ickes. Only portions of the last two buildings remain, and I imagine they won't last until the end of the week. She says Chicago is still two cities - one sparkling and grandiose, the other dismal and devestated. And the kids growing up in the second city, she says, "Most of the kids growing up in Roseland and similar neighborhoods in Chicago have no connections to the city's other half." She says the public housing transformation exacerbated this problem, pulling more people from the city's center and making it into a place where they don't belong. I've been reading American Apartheid lately, a book which postulates that our urban problems can be linked back to our history and continuing racial segregation. We are still the most segregated big city in the nation. What do you think? 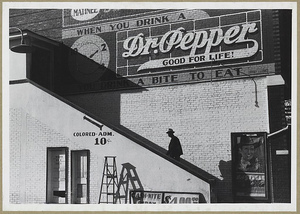 Is Chicago still two cities - one white and one black? Another blogger blames the death of Derrion Albert on Obama and advisor Valerie Jarrett. In other news, the recession and housing crisis could make the upcoming census that much tougher. With so many people having moved from foreclosed homes, it's hard to track them down. And although housing numbers are rising in the economy now, some say it won't continue. This recession may be in the shape of a W, they say, and after we rise up, we may fall flat again. Two public housing scandals going on right now, with St. Paul, Minnesota's Section 8 program facing allegations that they mishandled federal funds, shorting voucher holders and potentially owing the federal government $1.3 million dollars. And in Charlotte, West Virginia, public housing residents were dealing with dangerous and disgusting living conditions, including holes in the ceiling, gas leaks and meat and roaches coming up through their drains. A local TV station stepped in, and problems were fixed. Every year, the Chicago Housing Authority puts out a plan for the next, a large document filled with everything they expect to get done by the end of the next fiscal year. Tomorrow, the CHA commissioners will take a look at the 2010 plan and give it their stamp of approval.